Though Walker, who will be enshrined in the Naismith Memorial Basketball Hall of Fame in September, doesn’t find it easy picking the team. Walker will be surrounded Saturday by at least the images of all five (on trading cards) when he makes a rare Chicago appearance at the Chicago Sun Times Sports Collectible Convention at the Stephens Convention Center in Rosement. Walker will be among dozens of Hall of Famers and former All-Stars in all sports at autograph stations. I’ve taken my son to that show and it’s probably the best show of its kind I’ve ever seen, a true adult sports toy store and wonderful for sports fanatics. Walker is scheduled for a Saturday appearance and we got to talking about the NBA Draft, and while Walker isn’t that familiar with all the prospects, he does know their story. He was mentioning Kansas’ Thomas Robinson, who went to Sacramento and whose story became known at the draft. Robinson is taking care of his nine-year-old sister after in a short period basically all her care givers died with their grandmother, grandfather and mother dying. It was a choked up Robinson talking about the events at the draft. It’s another reason why Walker says before you are too quick to condemn because of all the money and the stardom, people should try to understand what so many of these kids have been through and why this transition can be so difficult. Chet gives himself as the example. He was born in Mississippi, but his mother, Regina, decided to move the family north to Michigan because, among other things, she was not allowed to vote or go to school. Well, technically, it wasn’t against the law. But you’d get hung if you tried. “She wanted better for me, wanted better for my brothers and sisters,” said Walker, the youngest of the 11 kids, of whom two survive. “I was reading about Robinson and he’s going to walk into that room at the draft and there’s a check waiting for $5 million,” said Walker. “And his life never will be the same. He’s going to be able to take care of his sister, but he’s going to hear from people he’s never heard from or even thought he knew and they’ll be asking for $10,000. “The problem you have—and I had it—is most of these are nice kids growing up,” says Walker. “They respect their mothers and their mothers usually are religious (Walker’s mother was a devout Seven-Day Adventist). She didn’t want me to play basketball Friday nights. I needed to convince her to go to college I needed this. “We were shy and believed people are honest and religious, so when there were people in need we always were taught to help,” said Walker. “But you find out when you are giving someone a loan it is not getting paid back. “Especially when you grow up surrounded by poverty and you see other people suffering or who don’t have much or are in need, in a religious world you consider yourself blessed and you want to share those blessings,” said Walker. And so goes money fairly quickly, and not necessarily on luxuries. “I picked fruit religiously when I was 12, 13, sun up to sun down to buy a pair of (gym) shoes,” recalls Walker. “It’s not an easy life to get where you want to go. These kids have to dodge so many negatives, survive all the crime and shootings. Their families pray and hope for them. And then they become millionaires and people say they have it made. 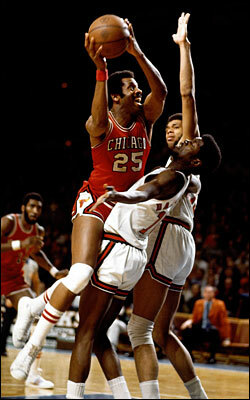 Walker didn’t make a lot of money playing in the 60’s and early 70’s era in the NBA when he was a seven-time All-Star and still remains the only Bull other than Michael Jordan to score at least 55 points in a game. He did some TV movie producing in Hollywood, but lives simply now in Los Angeles. The card show revenues helps him get by. He winces when he hears the criticism of LeBron James, whom he predicts will be among the top five players in the game when he is done. You don’t just turn into a mature professional the day you are drafted, Walker says. Especially when you grow up like James moving every few months because your mother has no money and passed around from family to family. If you’ve been there, you understand much better, Walker says. He says it’s a tribute so many of these kids do so well, but it’s also difficult to be who everyone else wants them to be. Chet says he’s looking forward to seeing Chicago and then Springfield in September. He’s had his own truly amazing journey.